Musings about art and writing supplies. 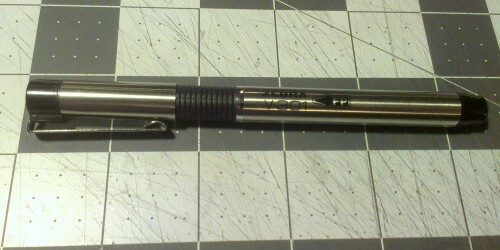 I had read a few good reviews of the Zebra V-301 Fountain Pen (V-301). 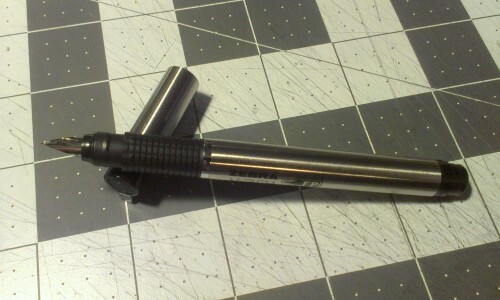 The V-301 features Zebra’s typical mixture of stainless steel and black plastic barrel. At first blush it’s not a bad looking pen. The imprint is a crisp clean screen print. The black plastic is well molded and looks pretty nice. The center section, is the grip and has a waffle pattern that keeps the plastic from being slippery. Which brings me to the first detraction I’ll make of the pen. 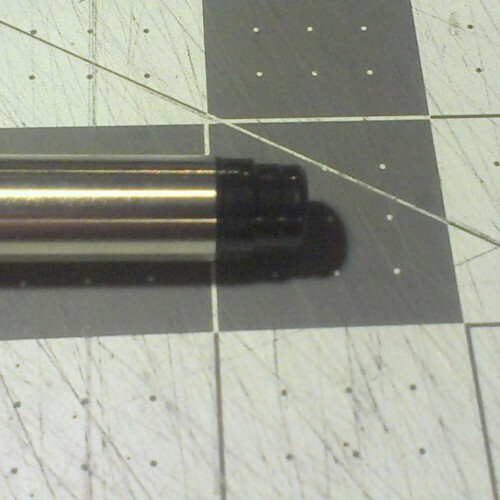 At each end of the pen the plastic is shiny but the middle section is flat. This makes sense because that waffle patterned plastic is the grip. I find it odd to mix matte and shiny plastics on the same pen. The pen is a nice diameter, neither too slim nor too thick. It’s a great size for gripping, even with my small hands. It is just large enough that it wouldn’t look ridiculous gripped in a big meaty paw. Without posting the pen is okay for writing but the cap is small and light enough that this pen can be posted without feeling off balance. It’s not a particularly long pen, even posted. The cap slides on and off the pen with a reassuring click. Letting you know it’s been removed or replaced. Even when you post it there is a click. My second issue with the pen is that the nib is diminutive when compared to the size of the pen. It’s on the ridiculous side and doesn’t look quite right. While others have reported that the pen writes well straight out of the package mine did not. It was quite scratchy. I had to get out my loupe and push and pull the tines into alignment and then I had to smooth it. Even still it’s not my favorite nib. It’s good for quick notes and such, but I wouldn’t want to take notes with it for a whole class nor would I wish to write out journal pages. The ink that arrives with the pen is acceptable, but nothing to write home about. It appears to take standard international cartridges. I have yet to test it with anything but the cart that came with it. I find the ink to be poorly behaved, feathering on a lot of papers and soaking through many others. 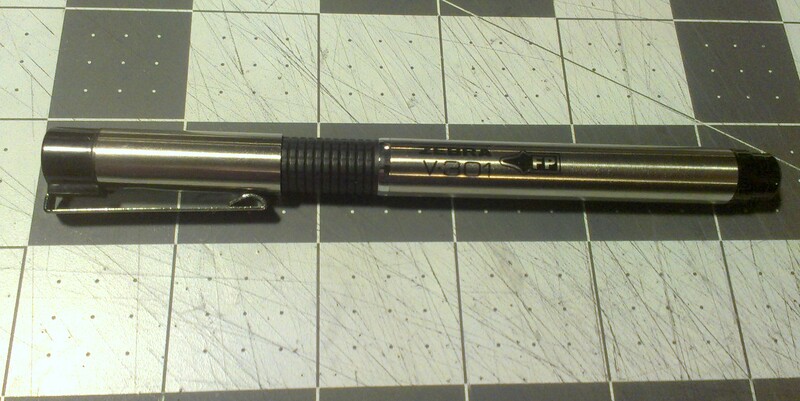 Overall, this is a $5 pen available at places like Walgreens across the US. I think it’s a horrible introductory pen for people. I’d much rather see people get the Parker Vector* (are they still made?) or another brand of fountain pen than this one. I know that others have reported good luck with these, but I really see this as a good pen for someone willing to tweak the nib and play with the pen to get a good writing experience. I think that you have a better chance of getting a good experience with a Platinum Preppy. *Perhaps I’m showing my age. The Parker Vector was readily available at my local Rite-aid just after I graduated from college. They were around $10 at that time. I found a few on eBay for about aht same price. This entry was posted in Review and tagged fountain pen, meh, not good, v-301, zebra, zebra v-301 on 20140930 by leslie. I'll send you occasional messages about cool ComfortableShoes Studio related stuff. Maybe once a week but more likely to be a few times a year. Staedtler's new Wopex pencils: the 2B - 2H Noris eco - Bleistift on Review Redux: Staedtler Wopex NEON!